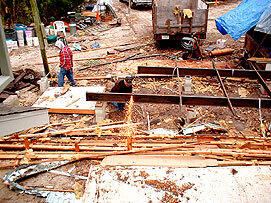 This point was very hectic for us owner/builders. 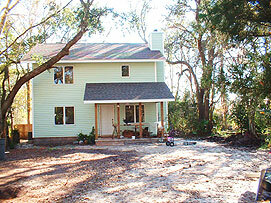 There were no more contractors to take the weight of the work and it was up to us to bring our home to completion. 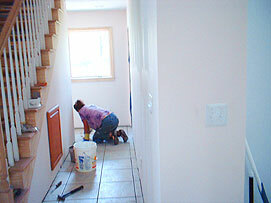 Here’s Elizabeth madly grouting the other half of the downstairs tile, having first made the living/dining room and kitchen ready for furniture, etc., a week or so before. After this, we moved the rest of the furniture in so the mobile home could be demolished before our final Certificate of Occupancy could be issued. Here’s Barbie running the hand truck back to her old mobile home to move the last of our stuff out before the wrecker’s start on it. It was a single-wide, built in 1967 so it was old and becoming quite decrepit. 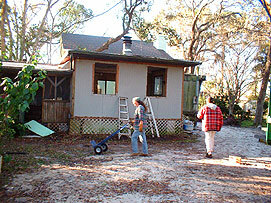 It had a substantial extension built on it and a free-standing porch to the side. Barbie found the experience somewhat bitter-sweet as it was her cozy home for nine years and served us brilliantly as a safe home base in the midst of the building site chaos. 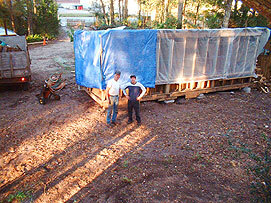 It took barely more than seconds for our crew of demolishers – Chris and Chuck – to have the walls of the extension mere skeletons and their special tipper-trailer was well on its way to being full with the first load to be recycled and/or dumped. 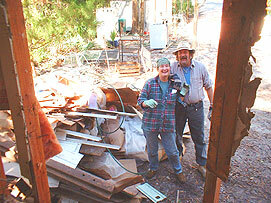 This guy in the photo with an arm full of old insulation is Chuck. The view from the extension. That’s Bill, a friend who likes to help, with Barbie, standing next to the first pile of recyclable old trailer stuff that Chris will either use again, sell or “weigh-in” for scrap. These two look ready to volunteer as trainee destruction engineers. 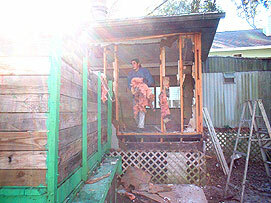 A rebel yell from Chris after he dropped the roof of the mobile home exactly where he wanted it by removing selected pieces of the skeletal 2″ x 2″ frame left after skilled dismantling. We were a bit wary as the house was just to the right of the roof in this shot. However, Chris put it within 2 inches of his prediction, missing the house by barely a foot, and impressing us no end. 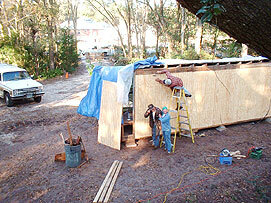 The guys soon had the roof and floor dismantled and started cutting the frame apart with a welding torch. Here’s Chris amid a shower of white-hot sparks, chopping the frame into easily managed lengths. Chuck is cleaning up. 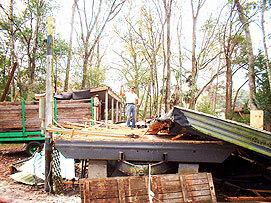 Soon the frame is chopped, the piles of debris cleared and the ground raked. We were amazed at how clean Chris and Chuck left the yard. In a couple of days it was hard to remember the mobile home had ever been there. Note the garden room has been left with no siding and had to have protection from the rain. Assuming they were done, we were mightily surprised when Chris and Chuck showed up the next day to help us put new T-111 siding on the rear of the garden room just to be helpful. Chris being a licensed builder, we got it done right. Here’s Barbie appreciating Chris for his extra help. Chris responds with a mischievous pull of his cap peak. Finally, our vision of a cozy two-story home under the trees was more-or-less complete and fully visible as the focus of this beautiful wooded lot. There were some minor details to take care of, like some trim to paint, wood to varnish and such, but we were fully moved in, had our Certificate of Occupancy in hand and the building process was officially over as far as the St. Johns County Building Department was concerned. We felt utterly exhausted but truly blessed.